(716) GAL-LERY, Buffalo’s smallest art gallery, is pleased to collaborate with two Buffalo arts organizations to present The Race Project. The gallery is a re-purposed phone booth inside the Hydraulic Hearth Restaurant & Brewery. 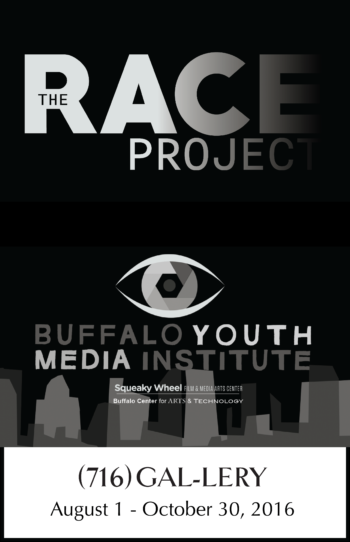 Squeaky Wheel Film & Media Arts Center is working in partnership with the Buffalo Center for Arts & Technology (BCAT) on this project with the Buffalo Youth Media Institute. The Buffalo Youth Media Institute, established in 2005, works to build social capital through the cultivation of critical thinking and 21st century skills, such as innovation, digital literacy, and collaboration. Through videos, lectures, critiques and hands on demonstrations, youth producers work with Squeaky Wheel’s lead teaching instructor and Director of Education, Kevin Kline, to learn digital production skills and create self-directed projects. More information on the Race Project may be found here. Visitors to the Gallery will be able to watch the video while listening to the audio on the vintage telephone. “We are proud to showcase the creativity of the students from BCAT. The topic of racism is particularly timely with the upcoming national elections; the students handle the topic in an open and moving way. We encourage viewers to take a look and listen in. Click here for more information about the Hydraulic Hearth and its (716) GAL-LERY . Click here for more information about Squeaky Wheel Click here for more information about the Buffalo Center for Arts & Technology.